HCM CITY (VNS) — HCM City authorities have signed a tourism co-operation agreement with 30 cities and provinces so that it can promote inter-regional tourism. Nguyen Thi Hong, deputy chairwoman of the city's People's Committee, said that enterprises in HCM City had invested a total of VND29 trillion (US$1.38 billion) in 1,000 tourism projects in other localities around the country. HCM City, Khanh Hoa, HCM City and Binh Thuan Province attracted the most domestic and foreign tourists, said La Quoc Khanh, deputy director of the HCM City's Department of Culture, Sports and Tourism. He said that about 90 per cent of foreign tourists visiting Tien Giang Province and half the tourists visiting Binh Thuan Province were customers of travel companies in HCM City. The city has just begun operating four river routes from HCM City to provinces in the Cuu Long (Mekong) Delta provinces and Cambodia, he said. Tourism co-operation has led to diversification of tourism products, but it has failed to attract day-trippers or big-spenders, due to poor branding of what's on offer and overly simple tours. The quality of products and services in localities were limited, making it hard to attract high-end tourists. Co-operation on a regional and national scale meant looking for policies and products as well as promotion, human resources and investment, said Ho Anh Tuan, Deputy Minister of Culture, Sports and Tourism. The number of foreign visitors to HCM City alone accounts for more than half the number of foreign visitors to Viet Nam. He said HCM City had the potential to receive and also distribute tourists to other parts of the country. 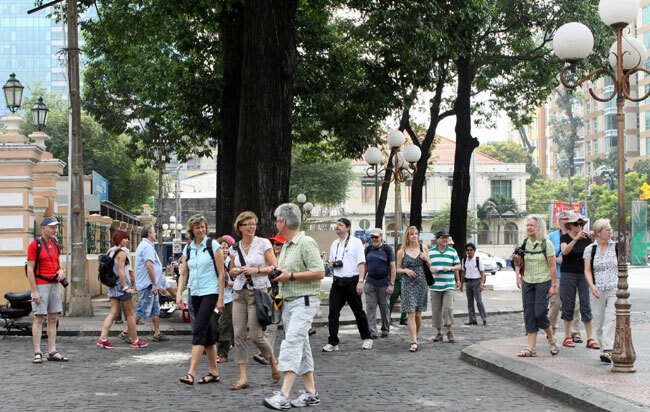 Last year, the city received more than 4.1 million foreign tourists, earning nearly VND82 trillion (US$3.9 billion). The conference, which attracted leaders from the departments of culture, sports and tourism in 44 cities and provinces is part of the tenth HCM City Tourism Festival that opened on Wednesday in HCM City.